Commemorative coins/medallions have been sent to many regions of the world, and it’s our dream that every nurse in the world will have a token of appreciation coin/medallion. The map below shows where in the world Nightingales have been recognized by the people whose lives they have touched. While many nurses will purchase gifts for themselves, friends, colleagues, students, and nurse family members, we realize many nurses in the world may be unable to access coins on their own. We envision carrying coins into villages in different parts of the world, asking Who are your nurses? and gifting them with a coin as a token of appreciation for the role they play in the health and lives of their communities. We cannot do this alone. Become a Flight Ambassador. If you are traveling to impoverished areas in the world and want to be an ambassador for the Return of the Nightingale™ Project by distributing coins to nurses, please contact us . Present a commemorative coin gift to a nurse in your life. For every coin that is purchased, we are designating a coin to be given through the Flight Migration. 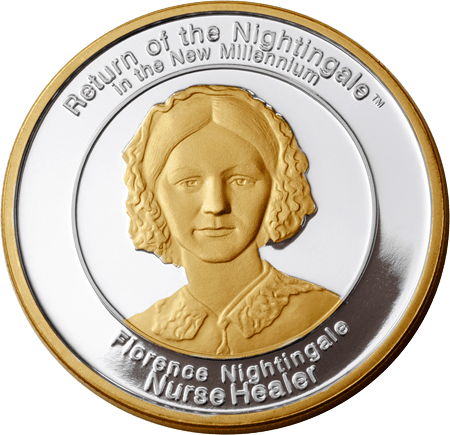 For every Fine Silver Commemorative Coin purchased, we send an Antique Bronze Commemorative coin to nurses in impoverished areas of the world so they also may enjoy the recognition and inspiration! Contribute to the Flight Fund and sponsor a nurse to receive a coin. Please contact us for details. Return of the Nightingale Nurse Recognition coins were taken to the District Hospital of Darjeeling in March 2005. “Great excitement” and “enthusiastic” describe the guide’s response when he was told about the project and asked to introduce the Flight Ambassadors of the Return of the Nightingale Project™ to nurses in Darjeeling, India. Just last year, his young daughter had been reading to him about Florence Nightingale from her schoolbook, so he recognized her name. His aunt works at the District Hospital of Darjeeling and would be very pleased to introduce them to the Head Nurse. The Head Nurse was presented with nurse commemorative coins to be given to nurses working there. She immediately recognized the beautiful image of Florence Nightingale on the front of the coins and smiled.